Suillus luteus, commonly known as Slippery Jack, is a most widespread summer and autumn fungus. It is the type species of the Suillus genus. 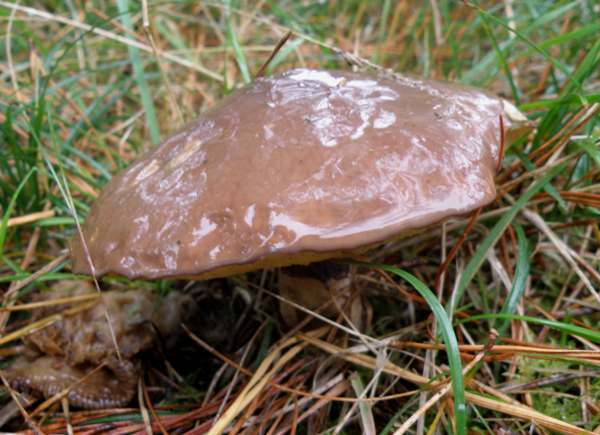 The very slimy (when wet) cap surface is the origin of the common name, which in some countries is applied to several members of the genus Suillus. 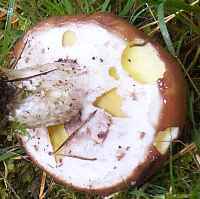 This edible bolete is most often seen in large numbers beside paths in pine woods, and it is one of the boletes that has a distinctive ring, white at first but discolouring with age. Suillus luteus is common and widespread throughout Britain and Ireland, always in or beside pine plantations. 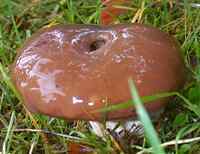 This bolete copes well in cold northern climes, and is very common in Scandinavia; it occurs also throughout the rest of Europe, Asia and North America. When in 1753 Carl Linnaeus described this bolete he called it Boletus luteus. Later, in 1888, Lucien Quélet moved it from the Boletus genus and named it Ixocomus luteus. The currently accepted scientific name of the Slippery Jack, Suillus luteus, dates from a 1796 publication by the French mycologist Henri François Anne de Roussel (1748 - 1812). 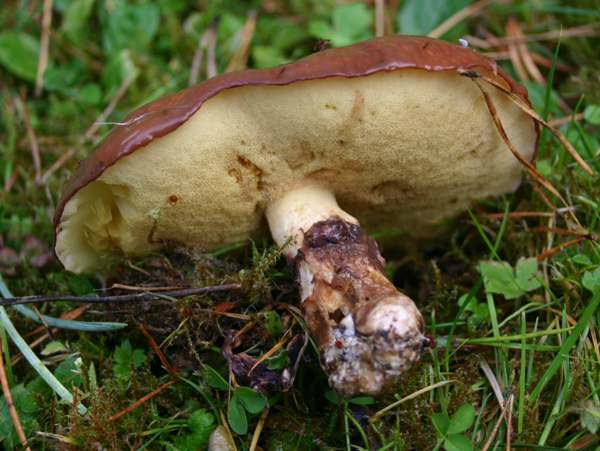 Synonyms of Suillus luteus include Boletus luteus L., and Ixocomus luteus (L.) Quél. Suillus luteus is the type species of the Suillus genus. The common name Slippery Jack (but please don't ask why Jack rather than Jill, Mary or Brian) is an obvious reference to the slimy nature of caps of this mushroom during wet weather - although they tend to become smooth and semi-matt and hence they are not particularly sticky during warm dry spells. The specific epithet luteus seems obscure, because the Latin prefix lute- generally implies saffron yellow (the pores are yellow, but more lemon yellow than saffron); however, another meaning of luteus is dirty or muddy, and that may be the origin in this instance. If you have a reference source for this please let us know. Meanwhile the generic name Suillus is much more straightforward, coming from the Latin noun sus, meaning pig. Suillus therefore means 'of pigs' (swine) and is a reference to the greasy nature of the caps of all fungi in this genus. 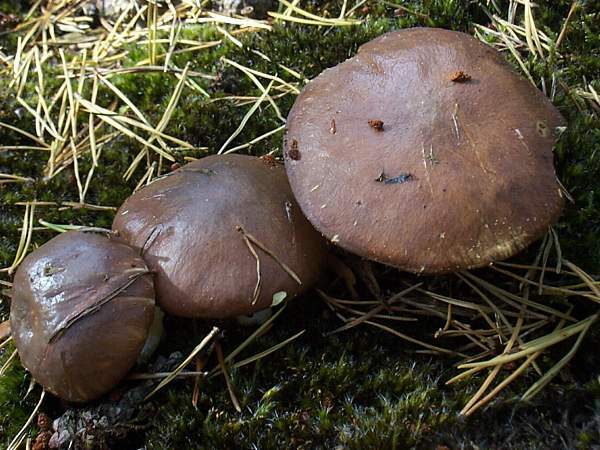 When wet, as shown on the left, the caps of this species are slimy; in hot sunny weather they dry to a smooth semi-matt finish. Usually dark chestnut brown, but occasionally quite a lot lighter, the caps of Suillus luteus grow to between 5 and 10cm in diameter. Beneath the cap, a white veil covers the lemon yellow pores of this bolete. The veil tears to leave an irregular ring on the stem and often pieces of veil hanging from the cap margin. At first lemon yellow, the medium-sized round pores darken to a sienna-yellow with age. 2 to 3cm in diameter and 5 to 10cm tall, the stem is pale straw-yellow at first, darkening with a dot pattern above the ring and with an irregular covering of brown longitudinal fibres near the base. 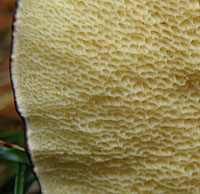 The large, floppy stem ring is white initially but usually develops a purplish tinge to its lower surface as the fruitbody matures. Sub-fusiform, smooth, 8-10.5 x 3-3.5μm. Mycorrhizal; beneath conifers in damp, usually shaded places. Suillus grevillei has a bright yellow-orange cap and angular pores; it occurs under larch. Although not generally rated very highly, Slippery Jacks are reported to be edible when thoroughly cooked. To reduce the risk of an adverse reaction to these kinds of mushrooms some people have found it beneficial to discard the cap skin of all species from the Suillus genus. Roy Watling & Hills, A.E. 2005. Boletes and their allies (revised and enlarged edition), – in: Henderson, D.M., Orton, P.D. & Watling, R. [eds]. British Fungus Flora. Agarics and boleti. Vol. 1. Royal Botanic Garden, Edinburgh.